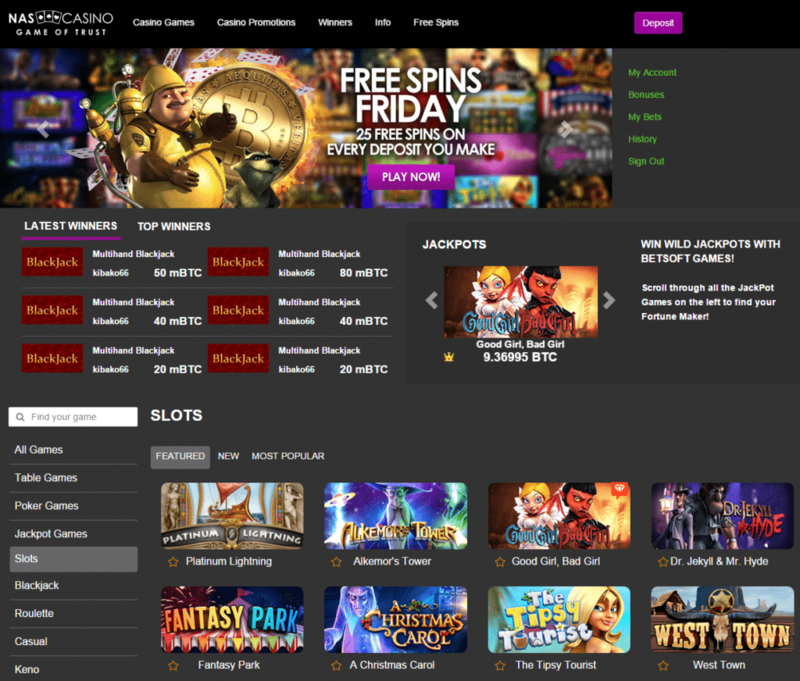 Nas Casino is a fantastic bitcoin gaming destination operated by Nabelse Holdings Limited, a company based in Cyprus. This site is fully owned by SoftSwiss N.V. and operates under the provider’s Curacao gambling licence. The excellent game selection at Nas Casino is courtesy of two well established providers – SoftSwiss and Betsoft. Therefore, customers can choose between a wide range of slots, table games and video pokers. Additionally, the site has a good jackpot game catalogue and titles that offer mouth watering top prizes. Completing the registration process at Nas Casino is simple and takes only several minutes. Visitors are asked to enter e-mail, password and username in order to create an account, which afterwards has to be verified. Naturally, prior to playing the games for real money, users have to make a deposit using the provided address and/or QR code in the banking section. Players at Nas Casino will find a good game selection supplied by SoftSwiss and Betsoft. Both developers are known for providing high quality games that run smoothly and have realistic sound effects. Additionally, Betsoft games are extremely popular thanks to their breathtaking 3D graphics and real-life-like animations. One of the top reasons to play at Nas Casino is the rich selection of progressive jackpot titles that can earn massive prizes to the luckiest players. At the time of this writing some of the most attractive jackpots were featured on Enchanted (19.66351 BTC), The Glam Life (1573.12677 BTC) and Greedy Goblins (49.07998 BTC). 110% first deposit bonus – Deposit at least 0.05 BTC and you can claim a 110% 1st deposit bonus up to 2.88 BTC. 50% second deposit bonus – Make a deposit of 0.01 BTC or more and you can receive a 2nd deposit bonus up to 1.75 BTC. 100% third deposit bonus – Third deposits of at least 0.25 BTC are matched with a 100% bonus whose maximum amount can be 2.5 BTC. Monday Night Magic – Make a deposit on Monday and get a 25% reload up to 0.1875 BTC. Thunder Thursday – All Thursday deposits are rewarded with a 20% match bonus up to 0.45 BTC. Free Spins Friday – Make a Friday deposit and get 25 free spins. Birthday Promotion – Enter your birth date and expect to get 25 free spins in the next 24 hours as well as additional 25 free spins every following birthday. Customers at NASCasino are no. 1 priority and therefore the site provides an excellent customer care. Users have three contact options when it comes to getting in touch with an agent. First, and the easiest, way is to use the chat window and get live help. The second contact channel is phone; the provider offers a US, ZA and GB line. Finally, the last option is to use the provided form and get a ticket. To sum up, Nas Casino is a reliable and trustworthy bitcoin gambling destination where players can enjoy a wide range of popular casino titles. Besides the game offer powered by leading providers, some of the site’s top features are the numerous bonuses as well as the top support.